Add water, heavy cream and half n half to a pot. Bring to a boil.Slowly add in the grits while whisking steadily. Reduce heat to low and cover. Cook for 5-7 minutes, whisking frequently Remove from heat. Add butter and salt and pepper to taste.Serve immediately. Grits thicken fast so serve immediately. 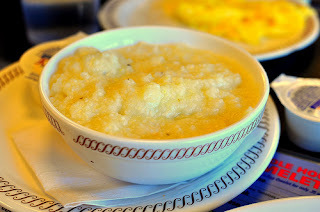 If grits are too thick, stir in a little bit of water or milk before serving. If grits are too thin, cook a little while longer or allow to cool slightly. Do u remember the brand of grits you used? Add cheese to em!!! Make some bacon and Jimmy Dean maple sausages and you're good!!! I made these this morning before church! Thanks a ton guys. Great Job....!